Storyteller: It was a cold winter’s afternoon, one of those days when you can hardly believe it could be much darker and still be called daytime. Storyteller: Joe and Mary arrived in Portland (or a city close to you) by bus. They were hoping to get to Boston (or the biggest nearby city), but this was as far as the money would take them. Back at home, people knew that Mary was going to have a baby. And they knew the baby wasn’t Joe’s. That was a hard one for Joe. Mary told him some story that no guy could believe, no matter how much he wanted to. It was a crazy story. Mary said an angel came to talk to her. Only a crazy person could believe it! Maybe Joe was a little crazy in love, then, because he stood by Mary. Maybe. He knew for sure they needed a place to stay that night, and that’s why they didn’t travel to Boston. He figured they could find a room in Portland, and if they really needed it, he had heard there was a good hospital in town. So they checked out the cheaper motels. But they were all full. Remember, it was Christmas Eve. 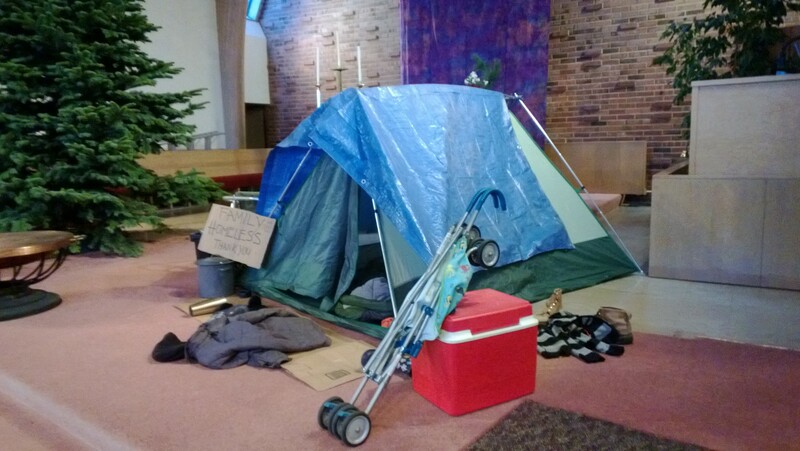 A homeless nativity at Alki United Church of Christ. Storyteller: They were standing outside a motel near the bus station, wondering what to do next, when they heard the wheels of a shopping cart and the jouncing of bottles and cans. An old lady pushed the cart toward them. She could see that Mary was very, very pregnant, and she offered to help them. She told them about the place where she pitched her tent and offered to let them sleep in it that night. They followed her to a place down by the railroad tracks, where they were surprised to see a lot of people besides themselves seeking shelter on that dark night. Storyteller: When they got there, everyone looked a little protective of their stuff. All except one. Her name was Angel. She had an overstuffed backpack, and as soon as she got a look at Mary, she started taking things out, looking for something important. At the bottom of the bag, she found it. Someone had come down to the day shelter giving out diapers, and she took them, because you just never know what you might need. At least that’s what she told Mary. Storyteller: Angel looked around the tent city and started telling her friends about Joe and Mary. She remembered the time she had a baby of her own, and she could tell just by looking that Mary didn’t have long to wait. Angel knew there were things Mary would need on that cold night besides the diapers. Storyteller: Sure enough, the baby was born that night. The people heard his first cry. From the edge of the crowd, a man came forward. He was one of those guys whose looks made you want to steer clear, a silent giant with a big dog and a grim expression. He rarely talked to anyone. He came right over to Mary, and Joe looked worried. Then they had a visit from a man who thought they might need a little something else while taking care of the baby. He was one of those guys who always has an opinion about everything, who always has a lot to say on every subject. Kind of a wise guy. But on this night, he quietly offered them his lantern. “You may want some light,” he said. Surrounded by new friends, the little family spent their first night together. Storyteller: When he looked at the baby, Joe was glad he had stood by Mary. Storyteller: Mary said nothing, but her smile told him how joyful her heart felt, even in the dark, cold place where the baby was born. Storyteller: You may find it hard to believe, but it’s a true story that they all felt warm that night, even the ones who didn’t have blankets. It’s a true story that the baby’s face shone even before the lantern cast its light. You may have heard about it. People may tell you it was only a rumor. But you should always listen to rumors of joy.